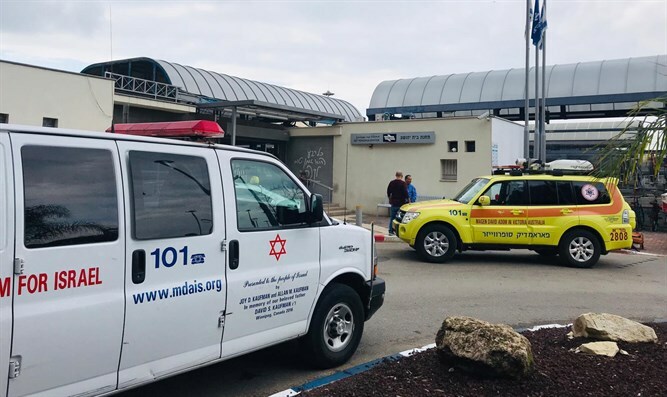 Man of about 30 takes own life at Beit Yehoshua train station; body thrown back onto platform hitting other passengers. A man in his thirties broke into the railway area at the Beit Yehoshua train station this morning, jumped before a passing train and was killed on the spot. Due to the force of impact his body was thrown back onto the platform, hitting other passengers. A 46-year-old was moderately injured and treated by an MDA team. At police order the station was closed to train traffic. United Hatzalah volunteer EMS personnel from the Sharon chapter reported from the scene that in spite of extensive efforts to save the person's life the pedestrian's death was pronounced at the scene due to the severity of the injuries they suffered as a result of the collision. MDA paramedic Orian Lukac said, "The sight was shocking. In the plaza on the platform lay a man in his 30's with very severe multi-systemic injuries. He was without signs of life and we determined his death on the spot. Another 46-year-old man waiting on the platform was hit by the man who was hit by the train and was thrown over. He was fully conscious and had bruises on his head and limbs. We gave him medical treatment and evacuated him to the hospital in moderate but stable condition." United Hatzalah's Psychotrauma and Crisis Response Unit was dispatched to treat four people suffering emotional stress and shock following the incident.